Seeing the recent article in TIME on debunking the myths of only children, I thought of Bill McKibben who told us all about this and more over ten years ago in his book Maybe One. He talks about how single kid families can work and are necessary to help ensure we not exceed “planet capacity,” or the population that the earth can support. Rosling thinks the solution is investing in the alleviation of poverty and green technology. One area that puzzles me is how he thinks that focusing on lowering infant mortality will somehow result in women having fewer babies. Birth control will result in fewer babies. Or does he think that if women know their babies will survive they will be more likely to use birth control thus have fewer babies? Others start with family planning as the solution to planet woes. The Optimum Population Trust believes that good family planning in poor countries is the way to reduce the likelihood of “catastrophic global warming.” It has done a cost-benefit analysis, and claims that getting info and access to birth control in order to majorly reduce unwanted pregnancies is the cheapest way to reduce carbon emissions. Others say no, forget population—it is not the problem. Take Fred Pearce, author of The Coming Population Crash. He says that because half the world is already at below-replacement birthrates, and those rates are still falling fast such that the world’s population will probably be shrinking within a generation. He also predicts that the planet could have almost 9 billion people before population “bomb” will truly be diffused and we’ll see a population crash. He believes consumption is the problem to be solved so all of those people can live on the planet. Two births per woman is considered a “replacement rate” for population. 125 out of 223 countries have above replacement birthrates, and 43/223 have double the replacement rate, with 4 or more children. With these kind of numbers how can he predict that the population will be shrinking in a generation? Seems to me getting to an environmentally sustainable population is a stew of all these factors: Get better reproductive health services and family planning services to poor countries to get them closer to replacement rates; decrease consumption, not just here where we are already the biggest hogs, but in other countries who insist on becoming super consumers like us; invest in green technology to avoid climate change and keep it cheap so poor and developing countries can afford to use these green technologies. But I still ask myself–what is the cutoff of the number of kids to have such that it will enhance the chances that they and others already here will live in a world that is sustainable? Still more to learn on all of this, but seems a reasonable position is literal replacement–replace yourself and that’s it. You want more kids after that–adopt one of the growing millions who need a home. What Do We Know About Babies in 2012? The answer to your question “what is the cutoff of the number of kids to have such that it will enhance the chances that they and others already here will live in a world that is sustainable?” is that each person, man or woman, has a responsibility to ensure that they do not have more than two children, and that their parents do not have more than four grandchildren and that their grand parents do not have more than eight great grandchildren. This algorithm stops population growth today. Population growth is unsustainable. It will stop either because we get this message and maintain a birth rate below two, or because more children die. However, we must do better than that because the world is currently overpopulated. We are consuming resources faster than they renew and those resources are essential to provide for the current number of people. While we attempt to figure out how to live sustainably we must bring our numbers down. The logic is straight forward. A growing population is not sustainable. A stable population is not possible unless the birth rate is managed by governments, therefore we must manage it. If we are managing it, we might as well manage it so that it declines so that there is more time to figure out how to provide for our numbers sustainably and so that there are fewer to sustain. Ted Rosling, the man in the video, has the cause and effect backwards. A low birth rate is not caused by wealth, but poverty is caused by a high birth rate. With an uncontrolled birth rate, the population grows until it hits the limit. At the limit, children die at the rate necessary to cancel the birth rate above two. For example, if the birth rate is three, then one in three children will die. When we humans improve our skills at providing for ourselves (i.e. better technology) the limit is increased which drops the death rate of children and thus the population to grow. Over the past 100 or so years, we humans have dramatically increased our skills and we’ve seen the population grow dramatically as a result. Scientists like Ted Rosling have noticed that with increased wealth the birth rate has dropped. But they make the mistake of concluding that there is a mechanism that forces the birth rate to drop. There is no such thing. He has found a correlation to wealth, education, and a lower birth rate, but he has not found a mechanism that guarantees a sub two birth rate, and he’s forgetting that there is a mechanism whereby a birth rate above two causes poverty. There is a mechanism that can keep the birth rate under control. It is knowledge. 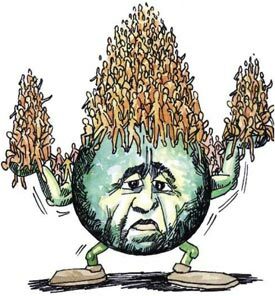 Everyone must have the knowledge that 1) a birth rate above two kills children, 2) that in the absence of regulations, you must limit your offspring to two, and your parent’s grandchildren to four and your grandparent’s great grandchildren to eight, and 3) that every country is currently overpopulated right now because we are consuming resources faster than they renew. These three simple facts must become common knowledge if we have any hope to stop the deaths that are caused by overpopulation.